How do we give a voice to kids who cannot speak? 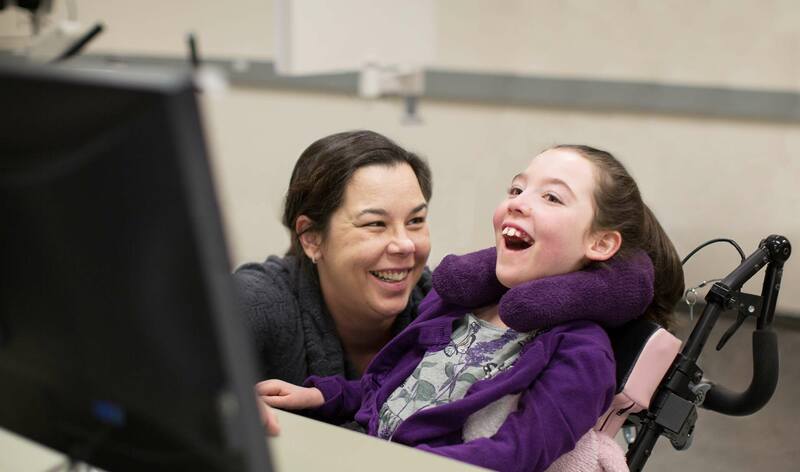 Dr. Tom Chau and researchers in the Bloorview Research Institute at Holland Bloorview Kids Rehabilitation Hospital have designed a suite of technologies to break down communication barriers for children and youth with severe and complex disabilities. Hundreds of thousands of children and youth around the world have disabilities that can impact their ability to interact and communicate with the world around them. As a result, there is a great need for customized, innovative technologies that create new pathways to enable children and youth to communicate through technology tailored to their own unique abilities. Prof. Tom Chau of U of T’s Institute of Biomaterials and Biomedical Engineering, Vice-President of Research and Director of the Bloorview Research Institute at Holland Bloorview Kids Rehabilitation Hospital, and his lab focus on doing just that – maximizing possibilities for children and youth with disabilities and special needs, along with their families, through applied science and engineering. “We know that children and youth with complex disabilities who do not have traditional speech or functional gestures are still able to communicate their thoughts and opinions when appropriately enabled by technology,” he says. Harnessing ability – be it a muscle twitch, an eye gaze, a blink – is an area in which Chau’s team has made significant advances in the last few years. They have even moved on to developing algorithms that can interpret physiological processes, allowing people to type on the computer, operate toys or turn the lights on in a room, without having to move a muscle. Another life-changing technology developed by Chau and his team is a device called the Hummer, a wearable sensor which measures vocal cord vibrations and turns them into commands for a computer, iPad or communication device. “Many children who cannot speak still have some control of their vocal cords,” says Chau. “This technology picks up on humming, and the vibration of vocal cords creates a periodic and regular rhythm that is translated into many different activities, including typing letters on a computer or interacting with the environment around them,” Chau says. “A 16-year-old boy was our first user of this technology, and he has effectively used it for four years now. He has become so proficient that he is able to play video games with his friends and is currently writing his autobiography.” To date, several dozen children are using the Hummer as a primary access pathway to communicate. Chau’s team has exploited near infrared spectroscopy, a device that introduces light to the surface of the brain in a non-invasive manner, making it possible to decode when the brain is processing a math activity or making a selection, for example. Understanding these differences has led Chau to develop new pathways for self-regulating blood flow in the brain, and using this information to understand when a person is making a choice. Chau says that this technique has the ability to decode a person’s preference in a multiple choice scenario with 80 per cent accuracy. The decoding process involves measuring the intensity of near-infrared light absorbed by brain tissue. How does mentoring transform communities?